Indian Head Massage itself is particularly beneficial for stress as it focuses on the areas most affected: shoulders, neck and head. This technique has been practised in India for centuries and focuses on the energy centres of the head, neck, face and scalp by using key acupressure points. An Indian Head Massage can be carried out as a separate treatment in its own right, in which case the client may remain fully clothed and be seated if preferred. 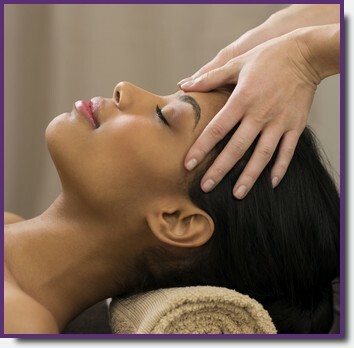 A treatment includes shoulders, arms and hands in addition to the traditional neck, face and scalp techniques. Price traditional seated £35 seated for up to 60 mins - also available as a reclined Hydrotherm treatment priced at £40 for 60 mins. There are a number of conditions for which massage is not suitable. These include D.V.T., serious heart problems, very high blood pressure, infectious diseases etc. For other medicated conditions, massage may be beneficial but the advice of your G.P. would need to be sought before proceeding.